Our Floor Maintenance Program meets our clients’ high standards by using professional cleaning techniques to keep carpets, fabrics and natural materials in optimum condition. Busy clients from a number of sectors count on us — major corporate facilities, commercial office buildings, retail, hospitality, educational, governmental markets, and major hotels. Your company's image represent the product and services you sell and first impressions are the most important. Therefore you know better than anyone that a dirty, smelly carpet is the worst way for a customer or potential customer to make the first step into your building. 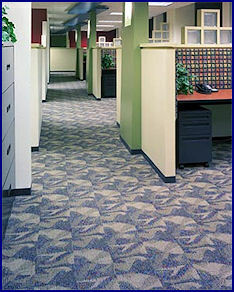 DFW Building Maintenance has a commercial carpet maintenance program tailored to your company's budget. Our knowledgeable customer service will help you customize that maintenance program that will maintain the fresh look of your carpet on top of cleaning and protecting it. The latest products have made hiding stains with furniture a thing of the past. We use safe products that will not harm your carpet without reducing stain removal effectiveness. Just like we do with all our projects, we test small areas to ensure that the method is the best. You will be satisfied and pleased with the results without paying an arm and a leg. Over the years, more and more abuse will be inflicted on your carpet, odors will be pushed in even deeper into the air with every step taken. What started as a smell, dusty and stale carpet and upholstery, is now all over your building as well. And that's just the beginning. DFW Building Maintenance utilizes the latest technology to safely and effectively neutralize odors. DFW Building Maintenance uses the Whitaker Smart Care® System for comprehensive carpet maintenance.The Whittaker Comprehensive "Planned" Approach identifies the total program of maintenance for the proper care of any facility's carpet. The integrated, four-step process prevents the buildup of sticky chemical residues and soil, protecting the color and appearance of expensive, carefully chosen carpets. This approach keeps your carpets looking better longer. Whitaker is the only Certified Interim Maintenance System to earn teh CRI seal of approval for both loop and cut pile carpets. Has everyday wear and tear has removed the luster from your floor? 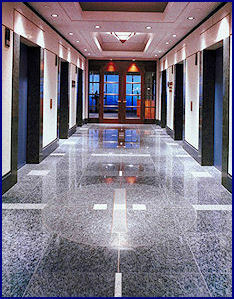 Terrazzo, Saltillo, Slate, Granite and Limestone are beautiful stones. Every Stone has its natural characteritics, and will require different cleaning products. Special techniques can restore your natural stone appearance. Whether you have vinyl / marble / ceramic / concrete / stone or linoleum floors, our cleaning crews are fully trained and qualified in all types of floor care. We follow all manufacture, federal, state, local, and organizational safety and cleaning specifications. Our trained professionals use the highest quality finishing and refinishing products to ensure your floor waxing is done with quality and durability.